Every so often I get or buy a cheap broken PlayStation controller and I fix it. since that feature is pretty crude in standard games. So I decided to write my own and upon completing it I'm sharing it with community. Burn a bin/cue image to CD and boot it on your console. 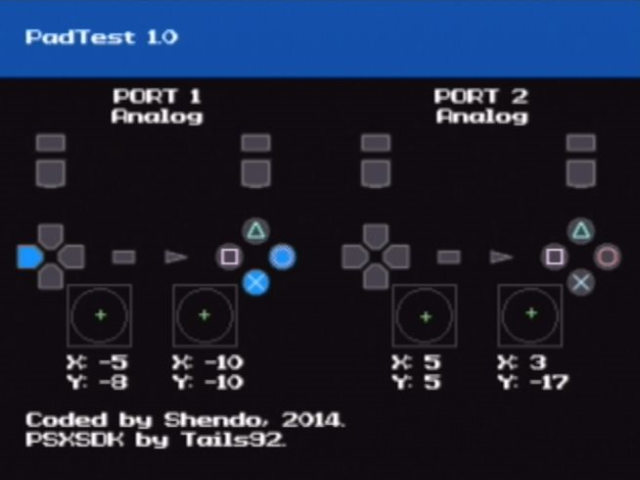 After that connect a controller of your choice to either port and test it's buttons. Analog controllers should automatically switch to analog "red led mode". To test rumble press L3 for big motor and R3 for small motor. This software is intended to be ran on the actual PlayStation 1 or PSone console.